Our mirrors really help you cover your blind spots. You can see the passenger side fine from the drivers position and the screws on the mirrors can keep everything in place, even at 80+ mph. Adjustable ball joint design and rotatable bracket, come with instructions, there are many adjustments to make it the way you want. These will never vibrate around like crazy at highway speeds. Wide Vision and Shake proof —– The long adjustable arms and 6.3 inch large square mirror give you great visibility with your doors off or on. Our mirrors gonna to hold well through wind and it is easy for you to tighten down with our included wrench. Tighten the brackets, they will stay in place without vibration or wobble . Tougher Steel Bracket Arms —– Sturdy & Durable, well match to your Jeep. Our brackets also coated with black powder for rust prevention . The screw which painting chrome avoid the problem of rusting. Base with Soft Foam Rubber Protects Paint from Scratches —– We won’t leave any traces on your car. 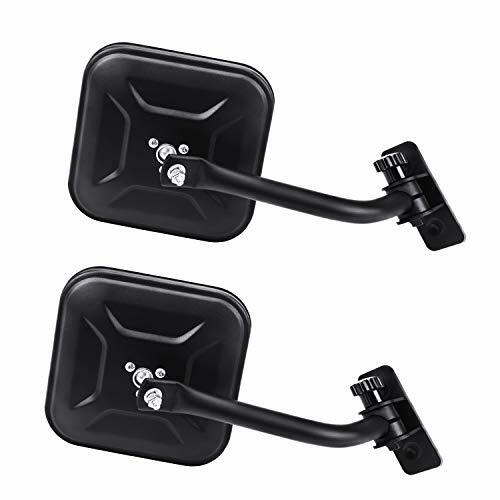 Fits for —– 4X4 2007-2017 Jeep Wrangler JK; 2007-2017 Jeep Wrangler JK Unlimited;2018 Jeep Wrangler JL.You can refer to the description for more details. Warranty Type —– 18 MONTHS Limited Warranty.